Samsung’s new PM1643 is a solid-state drive (SSD) offering twice the capacity and performance of its previous record-breaker, the 15.36TB version announced back in March 2016. With 30.72TB of storage available, this is the world’s highest-capacity solid state drive. It’s fast as well, offering read and write speeds of 2,100Mbps and 1,700Mbps respectively, which are almost double that of its 2016 predecessor. 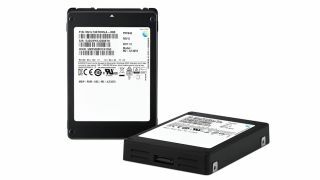 Samsung also promises that the new drive is reliable, durable and able to handle intense workloads. to the point that it can handle a full drive write every day over its five-year warranty period without breaking down. Samsung also says its enhanced software will provide such features as metadata protection and data retention from sudden power failures, together with an error-correction code algorithm that should ensure premium reliability and minimal maintenance requirements. Samsung is keen to accelerate the global storage transition from hard drives to solid state drives, and is planning on rolling out 15.36TB, 7.68TB, 3.84TB, 1.92TB, 960GB and 800GB versions of the same drive later in the year. It's probably just as well, as the previous 15.36TB drive retailed at $10,000 upon launch, which gives you some idea of just how crazily expensive the new 30TB options is likely to be. Want to learn more? Read the official announcement over on Samsung’s website.